No worries! We have all that you need to know about your missed EMI Payment consequences and remedial measures. Today a friend of mine tried to get loan for his house renovation.Even though he is working in a reputed company,his loan application got rejected .He was disappointed .When he pulled out his Credit Report he found out that he missed out couple of EMI payment of his loan while he was out of India . So he spoke with the bank and did settlement of loan .Also he informed Credit authorities so that they can take corrective measures well on time. Also there are other credit bureau in India like Equifax, Experian and CRIF who also give credit scores. With every default in payment CIBIL Score drops by few points. No matter if we do settlement with the bank, still Credit Bureau writes in report about the default in payment which affects the creditworthiness of loan buyer. Once we default in EMI’S payment Credit Score drops and then it takes lot of time to get repaired .Even if we go for settlement still we should inform respective CIBIL authorities so that repaired Credit Score can be reflected in report for future borrowing. 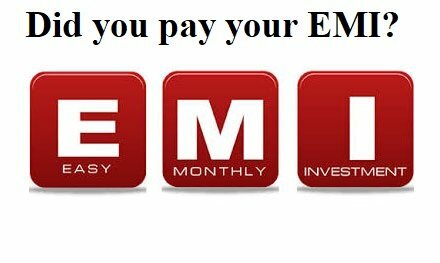 Once we miss out on the EMI’S late payment, it will cost us more in terms of payment of EMI’s with very high Rate of Interest. Ask bank for moratorium for the period when you can’t pay the loan. Ask bank to restructure loan if interest rate hike is causing you a no show during time of EMI repayment. 30% of credit score depends on repayment history, so talk to the bank about your option to sell the property and repay the loan. Offer collateral to the bank so that they feel safe. Keep honest communications with bank so that they don’t report to Credit Bureau and give you some time to recover.